Sir Thomas More. English statesman in the 16th century. Home » Sir Thomas More. English statesman in the 16th century. Sir Thomas More, 1478 -1535. Portrait of Hans Holbein the Younger. Sir Thomas More was an English statesman and humanist author, noted Renaissance humanist, councillor to Henry VIII, and Lord High Chancellor of England from October 1529 to 16 May 1532. He is a saint and martyr of the Roman Catholic Church (Memorial Day June 22). Pope John Paul II in 2000 declared him the “heavenly Patron of Statesmen and Politicians. 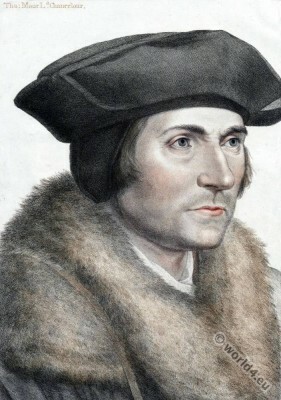 To say that Sir Thomas More was the brightest character of the age in which he lived, an age which exhibited the ferocity of uncivilized man without his simplicity, and the degeneracy of modern times without their refinement, were praise beneath his merit: to challenge the long and glittering chain of English biography to produce his equal at any period, might be deemed presumptuous: but, if the wise and honest statesman, the acute and uncorrupt magistrate, the loyal but independent subject, constitute an excellent public man; if the good father, the good husband, and the good master, the firm friend, the moral though witty companion, the upright neighbour, the pious Christian, and the patient martyr, form a perfect private character,-ecce homo. He was born in Milk-street, London, about the year 1480, the only son of Sir John More, a Judge of the King’s Bench, whose portrait has heretofore appeared in this Collection, by the daughter of a Mr. Handcombe, of Holywell in Bedfordshire. He acquired the learned languages at the hospital of St. Anthony, in the parish of St. Bennet Fink, then a school of high reputation, from whence he was removed to St. Mary Hall, or, as some say, to Christchurch, in the university of Oxford. Having naturally embraced his father’s profession, and soon becoming famous in it, he was very early a member of the House of Commons, and was distinguished there for a freedom of conduct which, at that time, could only have arisen from the purest motives. In this spirit, he opposed a tax which was required for the marriage of the Princess Margaret, sister to the King, who revenged himself, as has been already said, by committing the young senator’s father to the Tower. Henry, however, who with all his faults easily discovered, and generally encouraged, true merit, soon after directed Wolsey to bring More to the court, and having made him a Master of Requests, and a Knight, received him into the Privy-council, and sent him ambassador to France, and afterwards to Flanders. In 1523, he was chosen Speaker of the House of Commons; in 1528 was appointed Chancellor of the Duchy of Lancaster; and in 1530, in spite of his objection to Henry’s darling project of divorcing Queen Catherine, Lord Chancellor of England. Such, indeed, was his independent spirit, that not long before this period he steadfastly refused a present of four thousand pounds from the body of the clergy, for his watchful attention to the interests of that religion which he cherished for its own sake merely, and to which at last he sacrificed even his life. He sat but three years in his high office. Henry condescended once more to ask his consent to the divorce, and the Chancellor had again the boldness to refuse. A storm immediately gathered against him, and he prudently requested leave to resign, which the king granted, and accepted the seals with much seeming grace. He retired thereupon to his house at Chelsea, from whence it is probable he never after came to the court. Unfortunately he was called to attend the coronation of Anne Boleyn, which he steadfastly declined; and perhaps from this in compliment, rather than from his refusal of the oath of supremacy, or his opposition to the act for bastardizing the Lady Mary, we may date his ruin. He was committed to the Tower, accused of misprision of treason, and at last, owing to the treachery of Rich, w ho afterwards unworthily filled his chair, was indicted of high-treason, and beheaded on the sixth of June, 1535. He left issue by his wife, Jane, eldest daughter of John Colte, of Newhall in Essex, one son, John, and three daughters; Margaret, married to John Roper, of Eltham in Kent, who became the Chancellor’s biographer; Elizabeth, to the son and heir of Sir John Dancey; and Cicely, to Giles Heron, of Shacklewell in Middlesex: By his second wife, Alice Middleton, a widow, he had no children. It is almost needless to mention his literary works: His Utopia, and Life of Richard the Third, are well known; his smaller productions consist chiefly of Latin poems, and polemical tracts. Yet less necessary would it be to speak of his person, were it not for the peculiar character expressed in this fine portrait; where the artist, to the archness of a lively fancy, or the complacency of a benign mind, has most judiciously preferred the deliberating brow, and the doubtful but penetrating eye of the judge on the bench, searching for truth in the features, as well as in the words, of the culprit, or witness, supposed to be in his presence. Source: Imitations of original drawings by Hans Holbein in the Collection of his Majesty for the Portraits of Illustrious Persons of the Court of Henry VIII. With biographical tracts. Published by John Chamberlaine, Keeper of the Kings Drawings and Medals and F.S.A.. London: Printed by W. Bulmer and Co. Shakespeare Printing Office. 1792. The english boy king Edward VI. This entry was posted in 16th Century, England, Renaissance, Tudor and tagged English history, Portrait, Renaissance fashion era, The Court of Henry VIII on 11/15/15 by world4.